Easter is on it's way and who could blame you for daydreaming about candy eggs and chocolate bunnies. 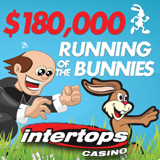 Over at Intertops Casino they're thinking about something even better than Easter eggs, namely the $180,000 in casino bonuses they'll be giving away over the next six weeks! All you have to do to make your way to the top of the leaderboard is play your favorite casino games. There are certainly lots of good ones to choose from including slots like Three Stooges II, big jackpot games like Jackpot Pinatas (holy cow -- that jackpot is currently over $1.7 million) or traditional table games like Blackjack and Roulette. Until April 8, $30,000 in prizes will be awarded every week. The top player on the leaderboard will receive $800, the second place player will receive $700, third gets $600 and the next seven players will receive $500 each. Every week, 250 players in all will receive prizes. You can check your current ranking any time on the Running of the Bunnies Leaderboard. The leaderboard is re-set every Monday so you can win bonus money more than once. If you finish in the top 15 players any week, you will be entered in a Grand Prize Draw for $1000 to be held on April 9th.